Home > Technologies > What is transfection? Transfection is the way to deliver exogenous nucleic acids such as DNA, RNA or oligonucleotides into cells. These nucleic acids can be transported by polymeric or lipidic transfection reagents that facilitate their cellular uptake. This process is commonly used for genomic studies (gene expression, screening, RNA interference, in vivo research…) but can also be performed for bioproduction (virus & protein production) or therapeutic purposes (human gene therapy). Delivery of nucleic acids into cells can be achieved by different physical methods such as electroporation, sonoporation or microinjection but these processes are relatively toxic for the cells. Transfection with chemical compounds is a safer alternative to maintain good cell viability. Entry of nucleic acids into cells cannot be performed without help from the transfection reagent to introduce nucleic acids into cells. This process comprises tree main steps: complexation of nucleic acids, interaction with the cellular membrane and entry into the cell, followed by release into the cytosol, and intracellular transport into the nucleus if needed for expression (Fig. 1). Nucleic acids are negatively charged due to their polyphosphate backbone and are thus able to interact with cationic transfection reagents (polymers or lipids) resulting in the formation of transfection complexes by which these nucleic acids are protected from nuclease degradation. The excess of cationic transfection reagent allows these complexes to be positively charged, which is mandatory to allow them to interact with the negatively charged cell membrane. Adherent cells express negatively charged heparan sulfate proteoglycans on the external surface of the cell membrane, with which positively charged transfection complexes are able to interact. This interaction triggers cellular uptake via an endocytosis process, allowing transfection complexes to enter into the cell encapsulated in endocytosis vesicles. Suspension cells express less heparan sulfate proteoglycans than adherent cells on their surface. They are thus generally more difficult to transfect because of lower interactions with cationic transfection complexes. The new generation of transfection reagents overcome these limitations and provide acceptable transfection efficiencies in many suspension cell types. Our company continuously innovates in developping new products to increase the transfection efficiency in such hard to transfect cells. Upon cell uptake, transfection complexes are sequestrated into intracellular vesicles. 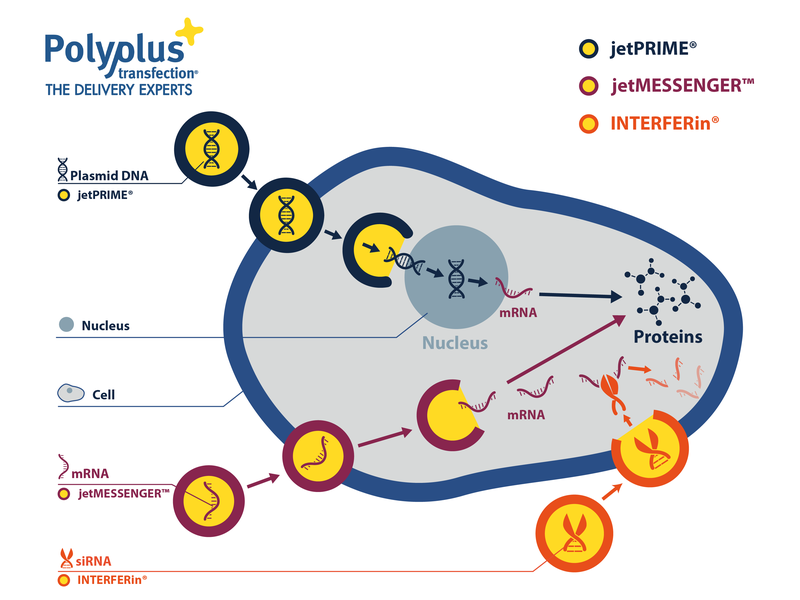 The most efficient transfection reagents are able to induce the release of the nucleic acids into the cytoplasm through vesicle membrane rupture or fusion. Many nucleic acids (oligonucleotides, siRNA, mRNA, etc…) stay in the cytoplasm where they are active. In case of gene transfer, plasmid DNA enters into the nucleus where they are expressed transiently or permanently after genome integration. Transfection is used in various applications such as in vitro genomic study, nucleic-acid based therapy or bioproduction. Researchers use transfection to transiently express exogenous genes in cells to produce new proteins or reporter proteins as well as to perform gene editing experiments (Fig. 2). Oligonucleotides are mainly transfected to inhibit endogenous gene expression for RNA interference, antisense applications, and to induce gene expression correction such as in exon-skipping applications. Fig. 2: Transfection reagents for in vitro genomic research. Our company offers several transfection reagents designed for in vivo experiments. Depending on the type of nucleic acid delivered, gene expression or gene silencing can be achieved in various tissues/organs. Different routes of administration can be used and largely determines the targeted organ in which nucleic acids will be delivered. Moreover, transfection reagents can also be used as a nucleic acid carrier for cellular-based therapy and gene therapy. We provide preclinical and clinical grade products for our customers performing clinical trials. In the bioproduction area, transfection is used to generate stable clones for production of recombinant protein and antibody. More recently, the use of transient gene expression has become intensively used for production of recombinant viruses and for production of small to medium quantities of recombinant proteins. Proteofection is a way to deliver proteins (or peptides/antibodies) into cells. The mechanism is very similar to the one used for transfection of nucleic acids. It is easier to work on a protein with a negative external charge as it will facilitate its complexation with the proteofection reagent and therefore entry into cells. This protein delivery is used for protein functional studies.